Coming Spring 2019! 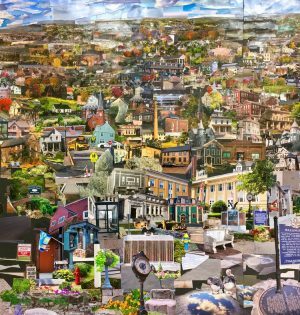 The Essex Townscape- Our History in Pictures is a participatory project with students of all grades and skill levels involved in the creation of the art piece. EES students and the community of Essex, CT is encouraged to join the activity. The photo collage will be created to depict the history of the Town of Essex by putting together photos of landscapes and historical buildings within the community. Over 500 photographic prints submitted by the community members will be incorporated into the project. Our town is rich in history.